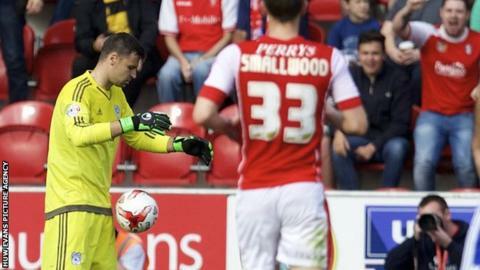 Cardiff City goalkeeper David Marshall deserved to be sent off in his side's 2-1 defeat at Rotherham United, according to manager Russell Slade. Marshall was shown a red card and conceded a penalty for lashing out at Rotherham striker Matt Derbyshire. Slade had no complaints about the dismissal but felt a foul should have been awarded prior to that. "Should we have been down to 10 men? Yes. Should it have been a penalty? No," said Slade. "The first offence is a free-kick to ourselves. It's a free-kick on Marshall. How the referee can say that he has not seen that is beyond me. "Unfortunately David has lost it, swung a foot and deserves to be sent off. "I'm very frustrated because he makes it a very difficult afternoon for the other 10 boys." Substitute goalkeeper Simon Moore, who replaced Joe Mason, could do nothing to keep out Vadis Odjidja-Ofoe's penalty two minutes before half-time. Peter Whittingham's fierce penalty after Farrend Rawson brought down Fabio levelled things before in first-half stoppage time. But Matthew Connolly's last-minute own goal saw Rotherham secure their first league win of the season and leave Slade frustrated. "I can't tell you how disappointed we are to concede so late on when we'd reduced them to one shot off the post and a header over the bar," Slade added. "I thought the lads showed great attitude under the circumstances we were put in. In my opinion we thoroughly deserved something out of the game. "